Chowbacca! 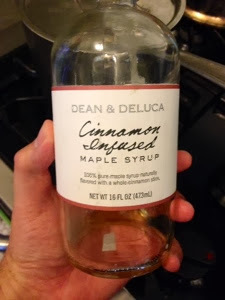 : Dear Dean & DeLuca: I Infused My Own Cinnamon Syrup, Thanks! 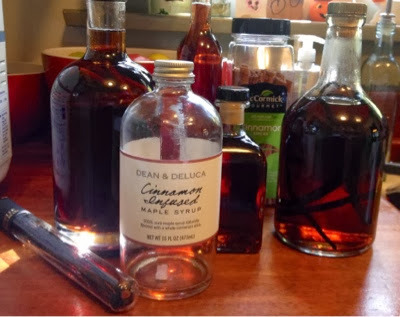 Dear Dean & DeLuca: I Infused My Own Cinnamon Syrup, Thanks! I AM DEAN & DELUCA!!!!! My Mother-Out-Law recently gave my family a wonderful gift she'd picked up from Dean & DeLuca. It was maple syrup infused with cinnamon and it was fan-tastic. The downside was that at only 16 ounces it went pretty quickly. Further down the slope was the price. Twenty-two #%$*! ?% dollars? For infused maple syrup? Well, it was time to put on my Dean & DeLuca hat and get to work making my own. My family and my wallet were counting on me. How did I do it? Well, for $15.80 I picked up a LITER of organic grade A dark amber maple syrup at Costco as well as enough cinnamon sticks for several more liters of syrup for $7.31. 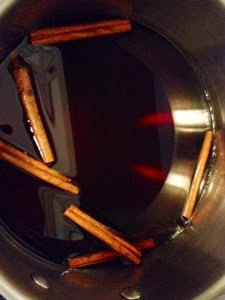 Then I poured the syrup into a saucepan, added three cinnamon sticks, and heated it all slowly over low heat for about a half hour without letting it boil. When things had cooled back down to room temperature I just popped the cinnamon sticks into cleaned-and-boiled repurposed bottles followed by the now-deliciously-infused syrup. I did the same thing with some vanilla beans and it's delightful. Next up: dry red chili infused syrup. Hot-cha! Of course I'll be giving my Mother-Out-Law some of each as well as gifting other family members a variety pack. Consider doing this yourself for those pesky holidays that are approaching. Update 11/13/13: After being bottled together since this posting the cinnamon, vanilla beans and syrup are getting along nicely. I tried them this morning and the flavors are awesome. By Christmas this stuff should be amazing. I'm still working on the chili syrup but I'll post results when I have them.